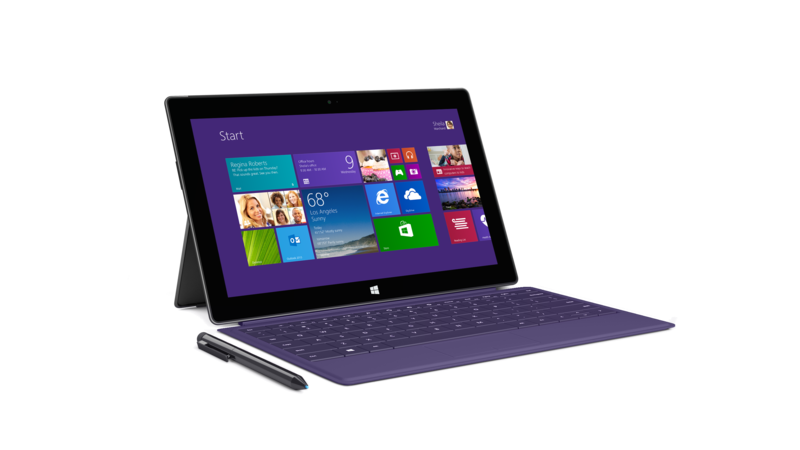 Microsoft reveals new Surface 2 and Surface Pro 2. Second time’s the charm? At an event in New York City today, Microsoft has unveiled its new generation of Surface tablets. The original Surface RT and Surface Pro never really took off, but that hasn’t deterred Microsoft from launching two new touch-friendly laptop and tablet hybrids. The refreshed hardware was unveiled in New York today and will continue Microsoft’s renewed focus as a hardware company. Microsoft claims that the new Surface Pro 2 is faster than 95% of all laptops available today. The new tablet has a 50% increase in graphics performance and 20% in overall performance. The Pro’s signature kickstand now has a second viewing angle intended for use in an individual’s lap or for taller individuals using the tablet on a desk. The Surface Pro now has Haswell architecture which brings a 20% improvement to the original Surface Pro’s notoriously weak battery. Overall, the Surface Pro 2 has a 75% improvement in battery life over the original Surface. Microsoft also introduced a successor to its popular keyboard cover. Dubbed “Power Cover”, the new cover can charge the Surface Pro 2 as it’s being used, resulting in 2.5x more battery life over the original Surface. A new docking station for the Surface Pro 2 will also be made available. The docking station can power up to two monitors and audio in/out. Raw data can be imported via three USB 2.0 ports or 1 USB 3.0 port, allowing for real time adjusting and editing for film. Type Cover II, the successor to the original Type Cover now comes in multiple colors and sports automatic keyboard backlighting. It is now 1mm thinner, the thinner profile allows for faster key presses since the distance each key must travel is shorter. Type Cover II is almost as thin as Touch Cover I. The keyboard is also quieter. The price on the Surface Pro 2 remains at $899. 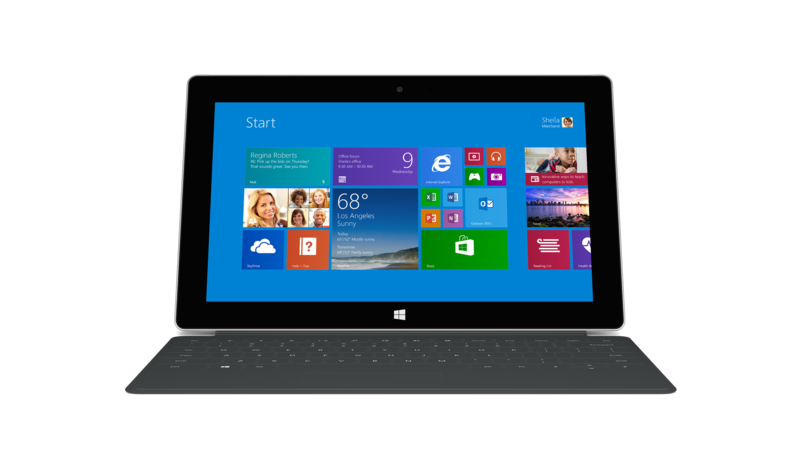 The Surface 2 is thinner, lighter and comes in both black and white colors. Like its Pro model cousin, the Surface 2 also sports a 2-angle kickstand. The improoved efficiency of the hardware allows for the Surface 2 to carry the same screen as the Pro 2, full 1080p cleartype HD with twice the number of pixels from the original Surface. It runs approximately 3-to-4 times faster while maintaining 25% improvement on battery life. The Surface now runs Windows RT 8.1 which allows for a 3 way split screen for multitasking, including full games. The Surface 2 now has 72 cores on its GPU, up from 12 on the previous model. The front facing camera has been updated with a new sensor that Microsoft says improves lighting greatly. The Surface cleverly adjusts to changing lighting conditions and maintains illumination on your face while chatting over Skype. Every purchaser of the Surface 2 gets one year of free international Skype calls and access to Skype hotspots around the world. All files and data on the Surface auto defaults to Microsoft’s cloud service, SkyDrive, allowing users to delete and duplicate their device information on a new Surface if they lose their own. To accommodate this, the Surface 2 comes with 200GB of free cloud storage on SkyDrive. The Surface 2’s new body design is made from two pieces of magnesium rather than 3, strengthening the durability. The new keyboard accessory for the tablet, Touch Cover 2, has more than 10 times the touch sensors of its predecessor and, like the Type Cover 2, is also backlit. The increased sensors allow for faster typing, fewer mistakes and predictive typing. The touchpad now has the ability to load alternative keywords called “Blades”, one of which was shown to us at the launch event. The “Remix Project” is a keyboard Blade that allows for instrumentation and sound mixing. The Surface 2’s price has been lowered to $449. Preorders on all new Surface products start tomorrow at 8am EDT and they will be available on October 22nd. Microsoft never disclosed official sales figures for the Surface RT and Surface Pro, but financial results published in July showed that it took a $900 million write down over unsold inventory. The company now has an opportunity to learn from those mistakes. It’ll be hoping that similar to the Xbox 360, the second iteration of its self-produced hardware finally strikes a chord with consumers. Ilan Nass is the Chief Marketing Strategist at Fueled, an award-winning mobile app design and development firm in New York City.